An incredible, all positive, highly practical off-leash experience for young puppies. Skills Taught: Calmly accepting grooming, Calmly accepting handling of paws, Politely greeting a stranger, Politely greeting a person walking a dog, Walking on a loose leash without the aid of a training collar, Walking on a loose leash through a moving crowd, Sitting for a manual examination, Sit, Down, Stay, Calm reactions to real-life distractions, and Out of sight stays. Transitions the dog and handler away from reliance on a training collar. Teaches practical pet manners beneficial to making your dog a more enjoyable companion. Prepares dogs for participation in therapy dog organizations, such as Happy Tails. The first three weeks teach the requisite skills. The fourth week of the class provides the formal American Kennel Club (AKC) Canine Good Citizen (CGC) test. Dogs that pass all facets of the 10-part examination will receive a graduation certificate from the AKC- even if they are not AKC registered! $110 at all CPT locations. 4 one-hour weekly meetings. 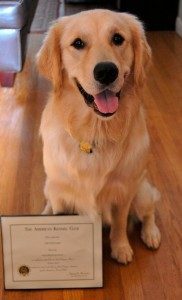 Duke proudly displays his CGC diploma. * All CPT Courses require pre-registration. Payments to CPT are non-refundable. CPT closes classes to further registration after 12 dogs enroll.